I’m hording all the asparagus! It’s all mine, MINE! I’ve been buying it cheap at grocery stores, rinsing it clean, snapping off the ends, patting it dry, and freezing for future use when this tasty veggie can no longer be acquired. However, I did set one bunch aside to make this unfussy, yummy pasta. 1. Turn the grill to medium high. Break the rough ends off the asparagus. Rub the asparagus in olive oil, and a sprinkle of salt, pepper & garlic powder. Grill the asparagus until grill marks for or until tender. Remove from the grill and cut into 1 inch pieces. 2. Cook the spaghetti according to the package directions in salted water. Set aside 1 cup of the pasta water near the end of cooking time. 3. 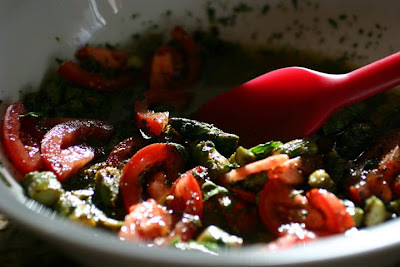 Meanwhile place ½ cup olive oil, the lemon juice, asiago cheese, salt, fresh basil, parsley, tomato slices, chopped asparagus, and lots of fresh pepper to taste into a large bowl and stir together. 4. Drain the pasta after setting aside the pasta water. Toss the hot spaghetti into the bowl to coat. Add additional pasta water if needed. Serve immediately. Notes: Asparagus can be cut into 1 inch pieces and sautéed in a skillet with a little olive oil, salt, pepper, and garlic powder in place of grilling. 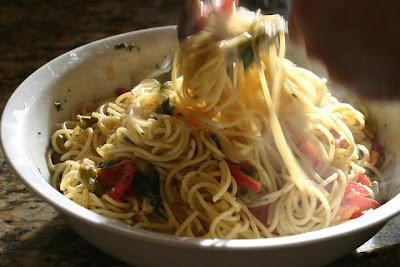 Just found your blog through Laura's (Life's a feast) This spaghetti sounds wonderful. I love pasta and what is better then a quick and simple one? It's delicious. How full of character this pasta is. Totally YUM! Love both the pictures too. This is one great meal. I've got some asparagus and asiago ready to go. Laura, this looks scrumptious and seasonal. It's a great recipe. ooh, you're smart to freeze asparagus, I should do that too while it's cheap! I can tell just by looking at this pasta that I would love it. It looks really similar to something I make, but with grilled zucchini. Yum! By the way, I'm making purple pizza this week and I'm super excited! Roflmao Ooops I'll go add it back in! Thanks! Yay Sara! I hope you enjoy it! Delish, delish, delish.... (tummy is grumbling right now!!!). I love the idea of lemon in spaghetti - something I must try! OMG! This looks so good. So unique. I found your site through Food Gawker w/ your Strawberry brownies. As soon as I saw this recipe I called one of my girlfriends up with this being the main course of our next dinner party!!!! Thanks. Yay! You'll love this one! Let me know how it goes. This looks so delicious. Such a bright and refreshing pasta dish. Perfect for summer with the veggies and squeeze of lemon. What a great recipe! I just made this (although I cut everything in half) and its to die for. I'm definitely going to save this (and blog about it....) thank you! Its nice when you can imagine how a recipe will taste and then be presently surprised that it tastes even better. I don't know if this has already been mentioned, but if you're buying groceries according to the list of ingredients, don't forget the pasta! I made this tonight and it was fabulous! Hubbie loved it. Very light and fresh for a hot summer night. Instead of the grill, I put the asparagus in a pan with olive oil and garlic and popped it in the oven for about 5 minutes. Had to run to the grocer at the last minute as I spaced and forgot the fresh basil and also only bought one large lemon. That only made 1/4 cup of juice, so I needed to get a second. Thanks for the recipe, Laura. Anne thank-you! I forgot to add the pasta in the ingredient list and would have never known it was missing. I'm so glad you liked this one. I love this kind of pasta too.